Our mythical beast of Gothic legend is known to ward off evil wherever it is placed. This captivating sculpture is meticulously detailed from its open mouth to its curved serpentine tail. 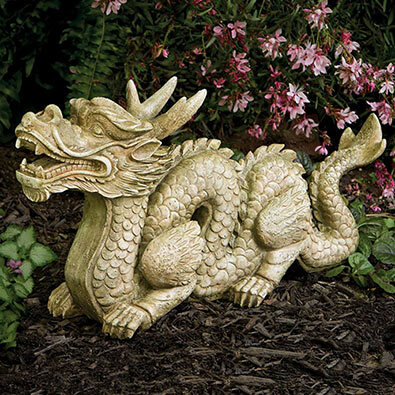 Place it in your yard or garden to defend your premises from the unknown. Sculpted of weather resistant polyresin with a weathered moss and stone finish. Measures 52cm x 30cm x 16cm. Create your own miniature diorama with our adorable seven piece bunny character set. Place your own container or add a touch of seasonality to your existing fairy garden. Each piece is cast of polyresin and hand painted with colourful details. Set includes: 12cm x 7cm x 5cm flower and egg farm stand, 8cm tall mom and pop bunny, 5cm tall hatching chick and tulip pot, 8cm tall junior bunny riding a cart pulled by a chick and a 7cm tall "Welcome Spring" sign. Makes a great centrepiece for the season. Three happy feline friends belt out a tune only they can hear in this adorable and uplifting statue. The detailed polyresin design adds a trio of smiles to any garden, yard or porch and is finished in a weathered verdigris style. 27cm x 38cm. Bow not included. These toad-ally awesome frog sculptures will be a striking pair for your home or garden. Sculpted of polyresin to resemble stacked, moss covered stones, each has dimensional metal eyes to keep a watch on things around the house. Set of two: large measures 15cm x 9cm x 17cm, small measures 9cm x 6cm x 11cm. Add a wild touch to your yard or garden décor with our realistic reclining zebra sculpture. Cast in durable polyresin and painted in bold black and white, it captures this exotic and fascinating animal in amazing detail. Measures 41cm x 22cm x 25cm. Our lifelike grey wolf captures the beauty of this magnificent wild animal. Long an endangered species in North America, many organisations continue to help protect the future of the majestic grey wolf. Cast in durable polyresin and hand painted with amazing detail. 43cm x 27cm x 13cm.